Gregg Salzman still feels the pain from where the shrapnel sliced into his face. 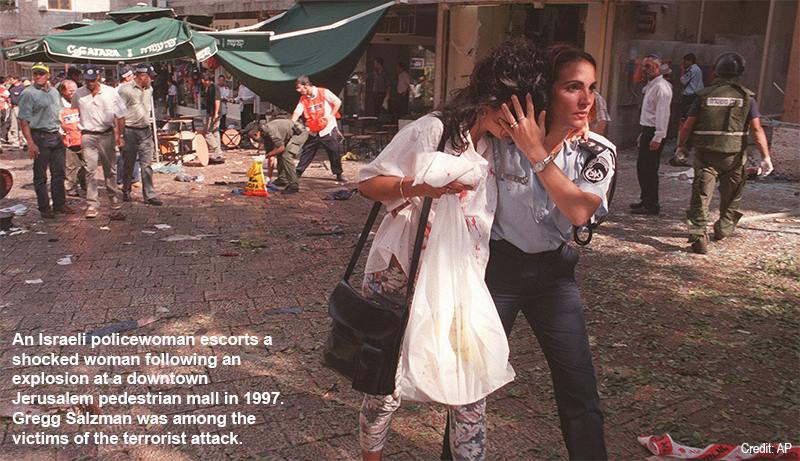 Nineteen years ago, the New Jersey chiropractor was walking through a Jerusalem mall when bombs packed with nails, screws, glass and chemicals detonated. The suicide bombings by Hamas militants left him with permanent nerve damage, a perforated eardrum and burns across his body. Gregg Salzman is still trying to collect compensatory damages. He still suffers constant pain and debilitating headaches from the shrapnel, which lodged itself above his upper lip. The physical injuries, however, were only the start of his troubles, he contends. Over the years, Salzman has relied on a battery of lawyers in the U.S., U.K and Canada to fight for judgments against Iran, which allegedly sponsored the mall attack. Here in the U.S., he was awarded $10 million in compensatory damages in 2003, but — like so many other terrorist victims — he has been unable to extract the funds from Iran more than a decade out from that win. In the meantime, he continues to work when he can, around the limitations of his injuries, as medical bills pile up. Although there have been moments of hope that the evolving field of terrorism-victim compensation law will one day bring him some measure of justice, the seemingly never-ending process — and the courtroom setbacks he says he suffered, such as being left out of a recent $9.4 million award to other victims of the same bombing — mostly left Salzman angry and tired. 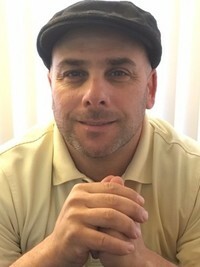 “It feels like just constantly getting knocked down,” Salzman told Law360. 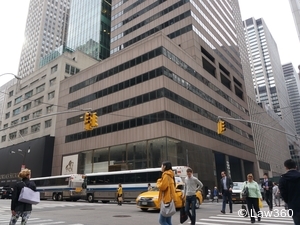 Currently, he is part of a sprawling web of litigation where victims are elbowing for the chance at grabbing proceeds from the sale of Manhattan office building 650 Fifth Avenue and certain other properties allegedly owned by Iran-backed entities. That and a new $1 billion federal fund for terrorism victims offer a potential reprieve in the near future, though even these two efforts are bound up in red tape. Salzman’s story is just one from a growing community of terrorism victims and their advocates, who are embroiled in power struggles that start at the top bureaucratic levels with government players jostling for control, and end, all too often, pitting victim against victim in courtrooms and administrative offices across the country. The new $1 billion fund, which was created by legislation included in the omnibus package that passed in late 2015, is being kick-started with money from the $8.97 billion deal that the Department of Justice entered into with BNP Paribas SA to settle charges that it conspired to push through a financial transaction that violated U.S. sanctions on Sudan, Iran and Cuba. The new fund also would refill its coffers with pieces of future penalties that the U.S. lobs at state sponsors of terrorism or other entities found to be connected to terrorism. The Congressional Research Service is predicting another $1.5 billion will come into the fund over the next decade. But even with this built-in revenue stream, the fund likely won’t be able to compensate all victims fully. Currently, U.S.-based terrorism victims are owed about $12 billion in court judgments where lawyers have yet to nail down assets to cover the bill. At least that’s the best estimate based off a running list that Washington, D.C., attorney Stuart Newberger has pinned to his office wall. The Crowell & Moring LLP partner has been at the forefront of several of the terrorism cases on that list, including a $335 million judgment that he won for victims of a 1983 Beirut embassy bombing. His numbers echo a 2008 congressional review of lawsuits against countries alleged to have sponsored terrorism, which indicated there was $11.39 billion in outstanding awards. Of the four top terrorist states with outstanding judgments against them, Iran by far holds the largest bill, according to that review. So when the Iran nuclear agreement that the Obama administration struck last summer didn’t include a nod to that outstanding bill, many of the victims and lawyers battling for compensation from car bombings, kidnappings and other attacks linked to Iran were upset. Smith, who co-founded Los Angeles trial boutique Howarth & Smith and represents terrorism victims, argues that of the $100 billion in frozen assets that Iran stands to get back as part of the nuclear deal, the U.S. government should have kept $10 billion for victims. For Smith, the absence of reparations in the accord is just another addition to a string of setbacks or missed opportunities in the U.S. government and courts. Smith represents Jeremy Levin, a former CNN journalist kidnapped in 1984 in Beirut by Hezbollah terrorists linked to Iran, and his wife Lucille Levin, whose attempts to rescue him were immortalized in a 1991 made-for-TV movie. Both are in their 80s and in poor health, Smith says. And they weren’t necessarily gung-ho about entering the legal fray to look for compensation. So far, though, the Levins have spent years pursuing first a $28.8 million judgment against Iran and now the payment of that judgment. For many victims, their court cases are about making a larger statement to the world that they will hold accountable those who helped terrorists. It is a motivation that has spurred many trailblazers in this litigation arena to wage decadeslong battles. Case in point: Edwena Hegna. Over the last three decades, the Arizona resident’s skin has wrinkled some and she has struggled with treatments for clinical depression. She has lost a son to complications with AIDS and seen her three other children spread out across the U.S.
And through it all, she and her children have been embroiled in a fight to secure compensation for her husband’s 1984 kidnapping and murder. In early December 1984, Charles “Chuck” Hegna was a 50-year-old diplomat looking to make his way home to his family for the Christmas holiday when his commercial flight from Kuwait City to Karachi, Pakistan, was hijacked by Hezbollah terrorists who diverted the plane to Tehran. Witnesses to the event have said in court documents that Hegna was the first to raise his hand when the militants asked Americans on board to identify themselves. He was subsequently tortured, shot in the stomach and left to die on the tarmac of an Iranian airport. “To a reasonable degree of medical certainty, Hegna suffered extreme pain and mental anguish from his gunshot wounds from approximately 6 a.m. on Tuesday, December 4, 1984, until his death, sometime before midnight on Thursday, December 6, 1984,” according to a 2002 judgment that awarded the family $42 million in compensatory damages and $333 million in punitive damages. The fight to get those judgments paid has taken the Hegnas and their lawyers, including the Connecticut-based Ralph DuPont, from U.S. federal courtrooms to the U.S. Claims Tribunal in The Hague. DuPont — who came to know and represent the Hegnas because a personal friend was also killed in the same hijacking incident — says the family’s legal efforts are about more than just finding assets to tap. Too often, the judicial system pits victims against one another in their efforts to make terrorist sponsors or other abettors pay. A prime example is the New York federal case revolving around assets forfeited from purported Iran-backed entities, the prized jewel of which is a piece of the 650 Fifth Avenue tower. Salzman inked a deal in 2014 with federal prosecutors to get in line to nab a piece of the proceeds if the case survives a number of appeals. Both the Hegnas and Levins have also been fighting to secure a piece of the same proceeds. The Hegnas, who have been fighting for a share since early on in the case, argue that they had a 2002 lien on all Iran-owned property in the Southern District of New York, and they are currently appealing to the Second Circuit a ruling that looks to block them out. Last year, the Levins tried to intervene in the 650 Fifth Avenue case, arguing that it was “a miscarriage of justice” that the U.S. government had struck a deal with only a select group of terrorism victims to split up the property proceeds. The way the 650 Fifth Avenue case has played out has placed the DOJ in the awkward position of putting some victims — those who timely responded to a published notice in the Federal Register — above those who missed the deadline. For the Levins, the court’s decision to deny them entry into the case, which was affirmed this month by the Second Circuit, stung, since they had agreed in other cases to share assets with intervening groups because it was the fairer thing to do, according to Smith. 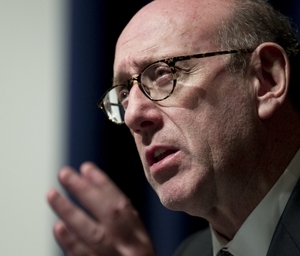 The American government’s first attempt to directly compensate terrorism victims through a fund also inadvertently pitted victims against one another by creating classes of victims, according to Kenneth Feinberg, the attorney who served as the “special master” of the first fund to support victims of Sept. 11. Legislation creating the 9/11 fund passed less than a fortnight after the attacks, without any congressional hearings. “It was enacted by Congress in a patriotic effort to rally the country and to discourage lawsuits against the airline or World Trade Center,” Feinberg said. With no previous precedent for such a fund and only the hastily passed statute to serve as a guiding light, Feinberg had to put together a system for deciding sensitive issues, such as who would be eligible to receive the funds and how the compensation would be calculated for each recipient. As mandated by the legislation, Feinberg turned to his experience with tort law to come up with the equations that took into account victims’ age, health and income to determine payouts. The fund was a success in that it helped to compensate victims and their families quickly. But having wildly varying payouts also led to Feinberg personally conducting 900 hearings with victims who were asking why they got less than their next door neighbor did. Feinberg had a much easier time recently serving as administrator for The One Fund Boston, a fund put together entirely with private money to help the victims of the 2013 Boston Marathon bombing. There, all the double amputees got the same amount and all of the single amputees got the same amount. “It was much easier, much more equitable,” Feinberg said. Much of the federal legislation revolving around terrorism victim compensation, however, has tended to be pushed through without all of the nuts and bolts of the schemes being worked out, according to experts. When the 2010 James Zadroga 9/11 Health and Compensation Act set up a second, broader 9/11 fund to help compensate many of the first responders that got sick in the years after the attack, the appointed special master Sheila Birnbaum had to start up the operation from almost thin air. Working from her own New York office at Quinn Emanuel Urquhart & Sullivan LLP with the help of deputy special master Debbie Greenspan, who had helped run the first victims’ compensation fund, she set about creating the fund’s infrastructure: picking personnel, crafting the methodologies for compensating victims and writing out the claims policy. To date, the fund has processed most of the claims it has received — but there is still work to do, which Birnbaum admits will likely move forward under another special master. “I think another five years would be a little much for me,” Birnbaum said. Buried within the 2,009-page omnibus spending bill that the president signed into law in mid-December was the reauthorization of the 2010 James Zadroga 9/11 Health and Compensation Act, which will keep that fund currently being overseen by Birnbaum running for another five years. 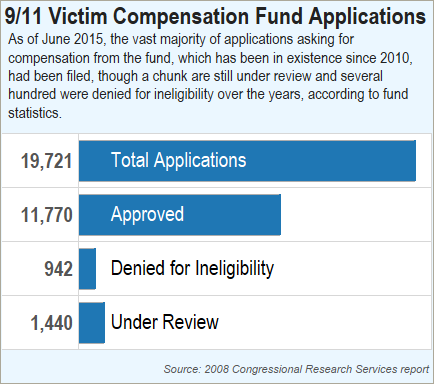 And buried within that — without having been debated at any congressional hearings — was the authorization of the new $1 billion terrorism victim compensation fund, which is being funded initially by the BNP Paribas penalties. This fund should cover a broader array of victims, including Salzman, the Hegnas and the Levins. While the new fund won’t erase all of the existing judgments, it will go a long way to ensuring that all victims with final judgments get at least something for their pain and suffering, contends Newberger, who helped lobby for and craft the legislation. It is the first fund to apply to any victims of state-sponsored terrorism. As currently structured, the fund will make payments on a pro rata basis that will afford victims about 10 cents on the dollar — or 30 to 40 cents on the dollar if assets from certain pending cases make their way into the fund. Additional payouts from the fund will be considered only after everybody is paid their pro rata share. In some ways, the new terrorism fund legislation is also Congress’ attempt to fix problems created by previous diplomatic and legislative efforts. For one, the new fund will offer long-barred compensation to victims of the Iranian hostage crisis, where 52 American diplomats and civilians were held captive and tortured for 444 days between 1979 and 1981. For years, many of those victims’ efforts to sue for compensation for their suffering were blocked by a provision in the Algiers Accord that freed them. As part of their release, the U.S. promised to keep any suits based on the incident from playing out in court. Five years after their release, the hostages received about $50 for each day spent as hostages. Under the new legislation, though, they will be entitled to $4.4 million in compensation, or $10,000 for each day held in captivity. Additionally, the fund in some ways attempts to fix the problems with judgment recovery that have arisen since Congress enacted a terrorism exception to the Foreign Sovereign Immunities Act about two decades ago. While the exception encouraged victims to go to court and sue states such as Libya and Iran, it failed to provide a good avenue for recovering actual funds. “I think that the problem Congress was solving was a problem Congress felt responsible for,” said Newberger, noting that judges have expressed frustration that they were given this job by Congress and they weren’t getting anywhere with the enforcement of judgments. The new fund highlights the delicate balance of bureaucracy and diplomacy that must be reached when trying to compensate terrorism victims, according to experts. Still, some in the industry think Congress should use its fund-creating powers sparingly, given that they can all too easily leave someone behind. It’s a sentiment echoed by Steven Perles, an attorney who also worked on the new fund legislation and who has represented terrorism victims in numerous high-profile court cases, including a rare handful that secured settlements and judgments. The new fund is not without its critics, however. Touted by supporting lawmakers as a major win for victims, the legislation seemed to appear out of thin air — at least to some observers who have raised an eyebrow at the lack of hearings. “In creating a billion-dollar fund, we’re leaving it to a very small number of people behind closed doors to have gotten this right without any consultation,” Bellinger said. But lawyers who spent the last year and a half or so pushing for the legislation contend that the fund is fair in how it looks to dole out compensation to victims, and they note that it came together in a rare burst of bipartisan effort between both the Senate and House judiciary committees. “There were no hearings because it moved very fast … [legislators] felt so strongly about this that they decided they were going to do it jointly and in a collaborative measure,” Newberger said. In the quick push to roll out the new terrorism fund legislation, however, a provision was added in at the final draft stage that may leave some terrorism victims behind, critics contend. The provision calls for fund participants to not only hold final judgments that have ridden out all possibility of appeal, but they must also hold an order showing that the foreign sovereign was served notice of the judgment. While on the surface this provision seems to ensure that the participants are fully eligible for the fund, it may create problems for those holding judgments against Syria because the State Department is presently declining to deliver service to Damascus. This could mean that otherwise-qualified terrorism victims will be left out of the fund. It could be fixed in a number of ways, such as the State Department starting service again, Congress passing a technical amendment, or the special master of the new fund simply waiving requirement for Syrian cases, Perles said. But it will be another hard decision that officials will have to make. Those currently embroiled in some of the highest-profile cases on the terrorism compensation front will also need to make some tough choices regarding whether to join in on the new fund. Under the law, those involved in the 650 Fifth Avenue case have three options when it comes to taking part in the fund. The same goes for those involved in a separate case in which lead plaintiff Deborah Peterson and other victims of the 1983 Beirut Marine Corps barracks bombing are pursuing $1.75 billion worth of funds owned by Bank Markazi in a Citibank NA account. One option is to fully elect to join the fund, which would mean that the victim also agrees to pool his or her winnings in the cases with the rest of the fund. That would sweeten the pot for everyone, but it could leave a claimant with less than he or she would have gotten outside of the fund. For those who join, the new fund will cap payments to only cover up to $20 million of compensatory damages for individuals and $35 million for families. And, depending on the number of claimants taking a slice of the funds, getting that full award may occur in pieces over time, though victims still have the right to pursue other civil litigation to try to get paid. The caps were put in place in an effort to be fair. With $12 billion of outstanding judgments and only a little over $1 billion guaranteed to be entering the fund, “it’s just a matter of trying to get everybody something,” according to a House Judiciary aide, who declined to be named. A second option is to opt out of the fund and gamble on a larger award in existing court cases, which may or may not come through. Currently, the defendants in the 650 Fifth Avenue case are appealing to the Second Circuit a judgment that granted the forfeiture of their interests to the U.S. government. The Peterson case is currently before the U.S. Supreme Court, with Bank of Markazi arguing that Congress overstepped its bounds when it crafted the 2012 Iran Threat Reduction and Syria Human Rights Act and included a provision that allowed the families of victims of the 1983 Beirut Marine Corps barracks bombing to collect on a $2 billion judgment. There is a third path, however, that most will likely choose to take. Under a conditional payment option, the victims in these cases can be entitled to receive compensation from the fund if their respective cases flame out in a ruling that goes against the terrorism victims. But if the case goes their way, the special master can deny them entrance into the fund. Salzman, for one, isn’t sure which road he will take. “We won’t know [if we join the fund] until we know how many hands are in the cookie jar,” he said. Natalie Rodriguez is a senior legal industry reporter. She has covered the 650 Fifth Avenue case since 2014. Follow Natalie on Twitter.